Sheila Day explained the reasons why officers were recommending this planning application was approved. She explained that it was for a sports hall and for moving a storage building. The sports hall had the potential for community use. Sports England response to being consulted on the application had been that its size with only one court and lack of changing facilities would limit its potential for use by the community. The proposed height of the sports hall roof was seven to eight metres, however there was an amended design for the roof different to the original application. It would be at least forty-five metres away from the nearest houses with greater separation distances in other directions. A condition proposed limited the use of the sports hall on Monday to Friday from 7am to 9.30pm, Saturdays 9am to 6pm and no use at all on Sundays or Bank Holidays without the prior approval of Wirral Council. 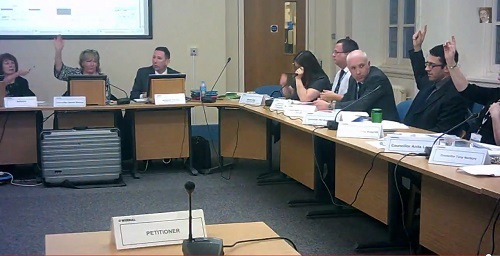 Wirral Council’s traffic and transportation division had no objection to the application on highway safety grounds. There was a qualifying petition of fifty-three residents opposing the application being granted. A Robert Davidson of 23 Guffets Rake, Meols addressed the Planning Committee on behalf of the petitioners. He described the area the site was in as a “residential area” and referred to policies HS15 (Non-Residential Uses in Primarily Residential Areas), RE1 (Criteria for Urban Recreation Facilities) and RE10 (Criteria for Community Centres and Facilities). He quoted from the report which stated “The scale of the proposed sports hall is considered appropriate to surrounding two-storey dwellings” and disagreed with this opinion as in his view it was of an inappropriate scale. Mr Davidson asked the Planning Committee to look at a photo of the existing school buildings which were all at a low-level and built with traditional residential materials. Mr Robert Davidson was also concerned about a change in ground levels between the school and housing and described the proposed sports hall as a “featureless rectangular box” with “industrial cladding” that looked like it was “straight off an industrial estate”. He did not feel it had any place in a residential landscape. Mr Davidson said that the school had started as a village school and that fourteen previous planning applications for the school were unopposed. The local residents had asked the school to compromise by reducing the height and changing the materials used. However the school had refused to do this. Mr Davidson referred again to policy RE1 (Criteria for Urban Recreation Facilities) and quoted from section two that “the proposals would not give rise to unacceptable levels of noise or other disturbance, particularly to areas of residential property”. He referred to the proposed condition limiting its use, however access to the school would be along small residential roads. The school was surrounded by housing and was a quiet environment when the school was closed and at night there was darkness and silence. The applicant chose not to address the Planning Committee, however a ward councillor for Hoylake & Meols Councillor John Hale did. He referred to the “excellent summary” by the petitioner and also referred to policy HS15 (Non-Residential Uses in Primarily Residential Areas). Councillor Hale said that HS15 allowed small scale developments in residential areas, but only ones that had no detrimental impacts on the character of the area or the amenities of the occupiers. The proposed height of the sports hall was twice the height of the existing buildings and a little higher which Cllr Hale described as an “alien feature” like the buildings found on an industrial estate. In his view it was out of character for that residential area. He felt that the community use of the sports hall and the resulting noise meant that it couldn’t comply with policy RE1. Although the residents expected noise form the school during the day from children, noise in the evening was a different situation. The school was a local amenity appreciated by the residents but he felt that as the maximum age of the children at the school was eleven that all that was required was a single storey building as a sports hall. Cllr Hale said that very few children he knew could hit a shuttlecock higher than the height of a normal ceiling. His objection was to the Planning Committee approving an application for a “monstrosity” in a residential area. Cllr Tony Norbury asked what the reason was for the height of the sports hall? Sheila Day replied that the height was a recommendation by Sports England as it would be used for badminton. Cllr Simon Mountney asked to see elevations of the proposed buildings. Cllr David Elderton said that he lived about half a mile away from the school and that he had lived in the area since the 1950s. In his opinion it was of a “grossly intrusive industrial style” and based on what he’d seen on the site visit would affect the visual and local neighbourhood amenities. He said he was all in favour of facilities but that it was a “bridge too far”, “too big” and that he’d prefer they go away and come back with something more sympathetic. Cllr Elderton said he would be voting against approval. Cllr Christina Muspratt asked why they were no changing facilities? Sheila Day answered that the school had existing changing facilities elsewhere on the site. Cllr Phil Brightmore described the sports hall as “huge” compared to the surrounding buildings. Sheila Day replied that the officer’s opinion was that the height of the proposed sports hall was similar to the heights of the surrounding houses. Cllr Eddie Boult asked what the extra height added to the existing building would be if planning application for the sports hall was approved? As it was a sloping roof on the sports hall an officer answered that it would be an extra 3.5 metres at one end and 2.5 metres at the other. Cllr Eddie Boult said he had listened to people’s point of view and was proposing refusal of the application based on his view that the height and bulk of the building was unsympathetic and that it affected the amenities of the surrounding area contrary to policy HS15. Cllr Simon Mountney seconded refusal of the application. Twelve councillors voted to reject the application (Cllr Stuart Kelly, Cllr Simon Mountney, Cllr Kathy Hodson, Cllr Phil Brightmore, Cllr Joe Walsh, Cllr Irene Williams, Cllr Bernie Mooney, Cllr Eddie Boult, Cllr Tony Norbury, Cllr David Elderton, Cllr Christina Muspratt and Cllr Paul Hayes). No councillors voted against refusal but Cllr Anita Leech abstained. The planning application for the sports hall was refused.